We conduct Full load / Destruction testing of all types of towers. - Our Tower testing and R&D station with its sophisticated state of art equipments rank it amongst largest and best of its kind across the world. Testing Capacity: Single Circuit Tower up to 1200 KV. 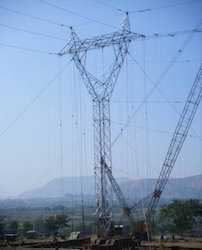 Double Circuit Tower up to 800 KV . • State of the art facility with SCADA/HMI based system. • Realtime Remote Access test witnessing. • Testing upto 1, 200 kV. • Over 376 Towers tested for customers around the world. - survey, route selection and tower spotting. - design and testing of ehv transmission line towers. - manufacture and supply of transmission line tower. - sourcing, selection, inspection and supply of line materials including conductors, insulators, hardware opgw/ew. : Tested 500 KV Double Circuit tower with Quadruple Conductor for NPC, Philippines and Sumitomo, Japan weighing more than 50 MT with height of ~80 MT, one of the tallest. Gammon T & D has state-of-the-art tower testing facility that is fully automatic with Supervisory Control & Data Acquisition (SCADA) software technology. Our tower testing station has been accorded "Recognition of IN-HOUSE R&D centre" by Government of India, Ministry of Science and Technology. • Over 300 Towers tested for customers around the world. - State-of-the art Tower Testing Station is one of the best in the world with microprocessor-based system for simultaneous application of load through multi-speed motors.